A rare lichen previously known to survive on just three trees in Scotland has been found at a fourth site. The new discovery of Anaptychia ciliaris, also known as eagle’s claws lichen, was made on a single aspen at an RSPB Scotland site near Kingussie. Edinburgh-based lichenologist Dr Brian Coppins said it had only previously been found on trees near Aberdeen, Kincardineshire and Perthshire. The lichen is found more widespread in England and south Wales. Eagle’s claws are rare because of air pollution and because Dutch elm disease has been killing older elm trees, which it favours. How the lichen came to be found near Kingussie in the Highlands was an enigma as its ability to reproduce was restricted, Dr Coppins said. He said it may have been more widespread in the area, but gradually died back to the one tree. 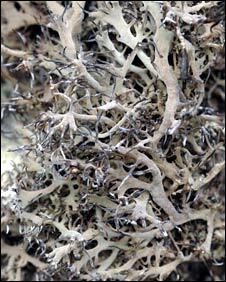 Previously, the lichen was found on single trees north of Aberdeen, Kincardineshire and Glen Lyon in Perthshire. This entry was posted on Thursday, February 11th, 2010 at 19:18	and is filed under In the News, Mycological. You can follow any responses to this entry through the RSS 2.0 feed. Both comments and pings are currently closed.